Andrew Morton is a former journalist and author of several celebrity biographies, releasing his first book Diana: Her True Story in Her Own Words in 1992. Angelina Jolie is Morton's most recent subject. In Angelina , Morton writes with utmost explicit detail not only about Jolie's childhood and upbringing, but also about the history of her parents Jon Voight and Marcheline Bertrand. Using details from interviews and his own research, Morton's biography is extremely thorough and is ultimately the perfect guide for anyone wanting to know anything and everything about Angelina Jolie; from facts about her paternal and maternal grandparents to her career, her many boyfriends and husbands, addictions, and much, much more. 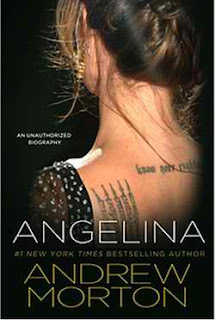 Angelina is full of Hollywood gossip and definitely provides insight into the lives of high-profile entertainers. While die-hard fans of Jolie will appreciate the inside information provided behind movie sets, Jolie's co-stars and the stories behind her own roles; Angelina is just too detailed for the masses and I predict that most readers will lose interest. Despite this drawback, readers will definitely leave with a better understanding of Angelina Jolie and why she continues to get a lot of press -- and not just due to her beauty. Morton's research has uncovered and exposed simple facts about Jolie's upbringing that explains her past and present behavior. Andrew Morton has also written Monica's Story (1999), Madonna (2001) and Tom Cruise: An Unauthorized Biography (2008); of these I have read Madonna which is highly enjoyable! Be sure to keep an eye out for his future biographies.